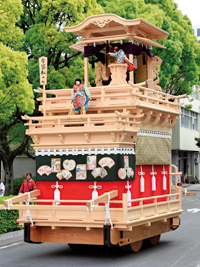 The Japanese Agency of Cultural Affairs proposed to the United Nations Educational, Scientific and Cultural Organization (UNESCO) that the yama, hoko, and yatai float festivals of Japan, including the Ogaki festival float parade, be added to the Representative List of the Intangible Cultural Heritage of Humanity. On December 1st, 2016, at the UNESCO's Intergovernmental Committee held in Ethiopia, this proposal was accepted, and these events were registered as Intangible Cultural Heritage. 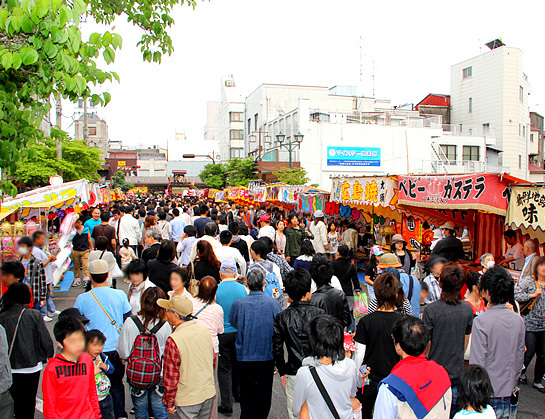 This is the first Intangible Cultural Heritage in Ogaki to be registered. 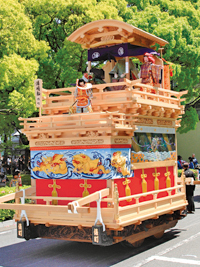 The Ogaki festival yama (or float) parade has been handed down as a castle-district festival event which has come to represent the Mino region. 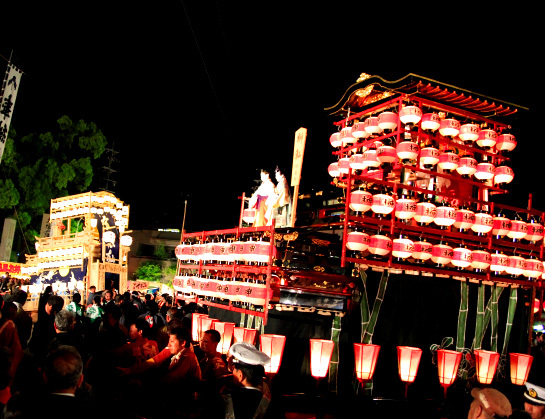 At this festival, the Ogaki feudal lord's yama and the yama of the townspeople were displayed together, a very rare case in Japan. 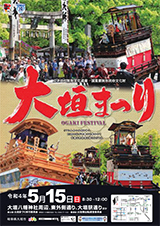 The Ogaki festival is a product of the interaction and exchange of festival culture between the eastern and western regions of Japan. 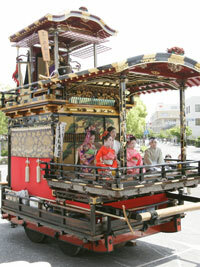 The dashi (festival car) events of the Chukyo area have influenced the karakuri dolls in Ogaki, just as the dashi events in the Kinki region have influenced the performances on the yama. This interaction is considered to be very important in understanding the dissemination and changes in Japan's yama, hoko, and yatai events. 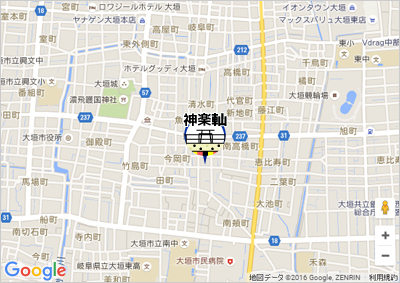 ※Paid parking areas are available for people arriving by car. 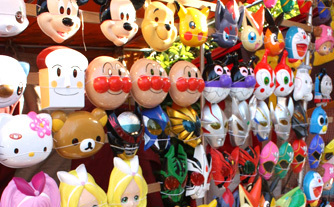 However, the Higashitogawa parking garage will be within the festival area and therefore unavailable for parking. Special temporary parking areas will be provided. Please see the reverse side of the flier for details. Schedule： ※For the latest updates about rain cancellations, etc., please check Facebook (Ogaki Tourist Portal). or Instagram (ogaki_mikke). on parade will be displayed here. The yama in the Ogaki festival date back to 1648, when the Lord of Ogaki, Ujikane Toda, ordered the reconstruction of the Hachiman Shrine, dedicated to the patron Shinto god of the Ogaki castle district. 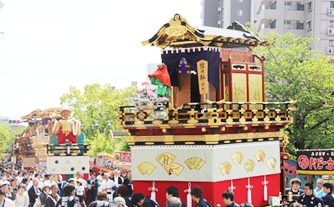 It is said that eighteen go (one go equals about fifty households) from around the castle donated three mikoshi (portable shrines), and ten of the Ogaki districts built ten yama, which were then pulled around the town to show their pleasure at this charity. In 1679, Lord Ujiaki Toda had three additional yama built, which were named Kagura, Daikoku, and Ebisu. 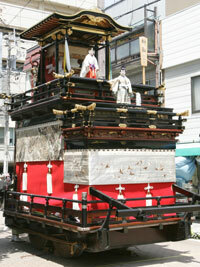 The ten Ogaki districts then added more elaborate decorations to their own yama. Many of the yama were lost in the Great Nobi Earthquake and during World War II. However, some were repaired and restored, and others rebuilt. In 2012, replicas of the last two yama were completed, putting all thirteen yama together again for the first time in 70 years. On Shigaku (the first day of the festival, Saturday), beginning at 8:45 am, each yama is presented in turn in front of Hachiman Shrine. 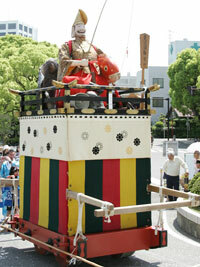 Then at 9:30 am, they are presented again in front of Ogaki City Hall. 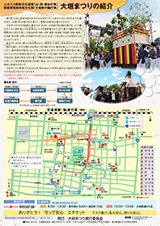 Following this, each yama is pulled around the city along individual routes until 7:00 pm, at which time the night parade is held. On Hongaku (the second day of the festival, Sunday), beginning at 8:45 am, each yama is again presented in front of Hachiman Shrine. 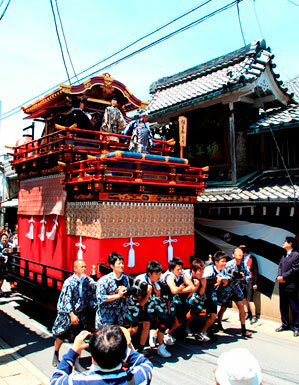 After this, the thirteen yama are paraded together along the same route around the castle district. 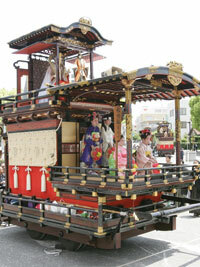 At 4:20 pm, the Ogaki festival procession is held, followed by another night parade beginning at 7:00 pm. 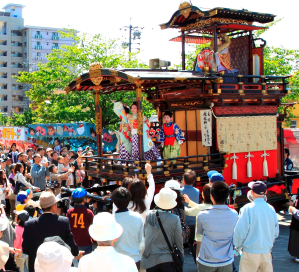 As would be expected for the largest festival in the region, large crowds line the roads, and the castle district is caught up in the beauty of the yama and in the excitement on the streets. 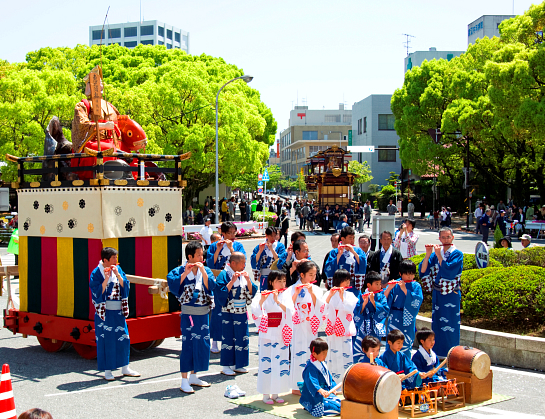 On the first day, after the shrine dedication performance, each yama is brought to the front of Ogaki City Hall to be presented there. 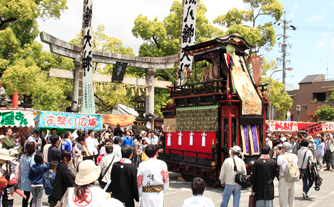 This event hails back to when each yama was pulled inside Ogaki Castle to be inspected by the Lord of Ogaki. In modern times, the mayor of Ogaki has taken over this role. In the evening, all thirteen yama gather in front of Hachiman Shrine. 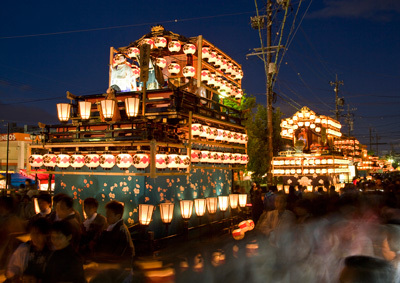 At 7 o'clock, the yama are illuminated with lanterns, performing and parading around again until they are pulled away for the night. ※On the second day, the shrine presentations aren't performed. 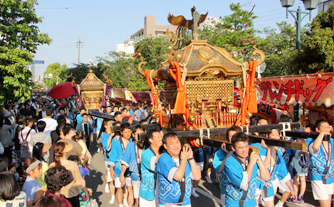 At 4:20 pm, the thirteen yama, accompanied by mikoshi (portable shrines), parade in the Ogaki festival procession, beginning at the Shin-ohashi Bridge and finishing in front of Hachiman Shrine. 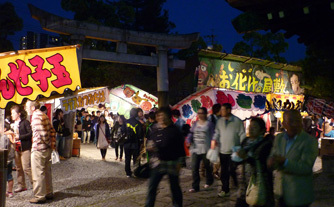 About five hundred stands for food, drink, games, and merchandise are lined up around the festival area, making this a very lively event. 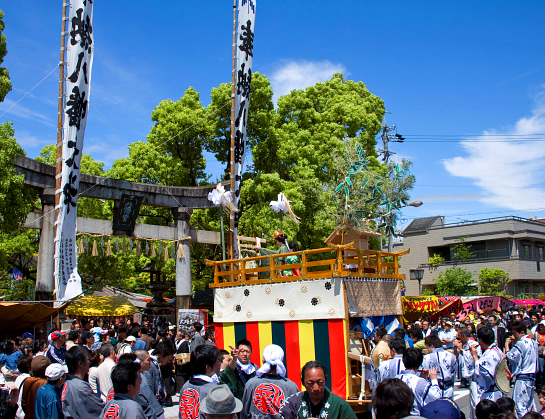 The people of Honmachi, Nakamachi, and Shinmachi take turns annually in pulling this yama, also known as the Oharai yama and the Ichi yama, which always leads the parade. The two Japanese puppets on this stage, a miko (a shrine maiden) and a yamabushi (a ascetic mountain hermit), are controlled with rods by people underneath the stage, an extremely uncommon method. The miko does a dance of prayer and purification while ringing a bell. The yamabushi holds bamboo grass in both hands while sprinkling flowers into a hot bath to purify it. The flowers (actually confetti) that it scatters symbolizes purification and the healing of disease. Like Kagura and Ebisu, this yama was handed down by Lord Ujiaki Toda. Perched atop two bales of rice straw, this brightly smiling figure with a mallet in his right hand and a packed straw bag on his left shoulder is said to represent the god of prosperity, Daikokuten, one of the Shichi-fukujin (seven gods of fortune). 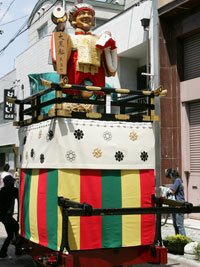 The people from Uoya-cho, Takejima-cho, and Tawaramachi take turns annually pulling this yama. It is a custom to not kill mice, which are strongly associated with Okuninushi-no-mikoto (another name for Daikokuten), in the district that is responsible for the yama that year. It is said that in 1679, Lord Ujiaki Toda dispatched people to Hirota Shrine in Settsu, to pray to the god Nishinomiya-Okami, another name for Ebisu (another of the seven gods of fortune). It is said that the famous artist Hidari Jingoro made a sculpture of the great god Ebisu. When the god's face began peeling, a painter began to repaint it; however, when the he touched the face, flames began shooting from its mouth. 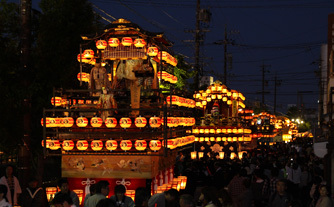 On the second evening of the festival, when all the events are finished and all the other yama have been pulled away, the people from the district responsible for this yama that year ceremonially hand it off to the next district at the O-kashira-watashi (literally 'passing the head') ceremony. This ceremony has continued unchanged for hundreds of years. Funamachi/Tenma-cho/Gifumachi/Miyamachi take turns in alternate years pulling this yama. As this yama uses the theme of the Noh song Takasago, it is also called the Takasago yama. It has been lost to fire on two occasions, but in 1996 is was rebuilt again after 51 years and is presently the largest of the thirteen yama. The yakata dolls on this yama are an old man, Sumiyoshi Myōjin, and an old woman, Kannushi Tomonari. The man is at the apex of the yama while the old woman is in front. Dancing to the song Takasago (also known as Shikainami), Kannushi Tomonari from Aso moves quietly towards the center of the stage. The sight of Kannushi Tomonari suddenly turning into a sailboat at the climax of the music is quite impressive. After this the karakuri doll Sumiyoshi Myōjin begins his performance, playing with his sleeves and putting on his mask while dancing powerfully. 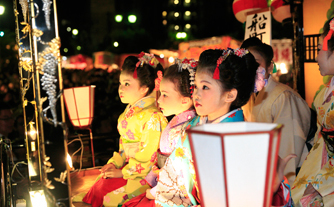 The dancing of the doll and the townspeople's performance of the traditional festival song Kamimai is very powerful. As Nakamachi's yama, Hotei, is associated with the ancient Noh song Kamo, the quality of the singing is excellent, and the equipment on the yama is outstanding. This yama was destroyed by fire in the Great Nobi Earthquake of 1891, but rebuilt in 1902. It was lost to fire again in 1945 during an air raid, and then finally rebuilt again in 2012. This yama is also called Tenjin. Destroyed by fire in the Nobi Earthquake, it was rebuilt in 1914 and began being used in the festival two years after that. It was painted with Japanese lacquer eight years later, and has remained the same since then. 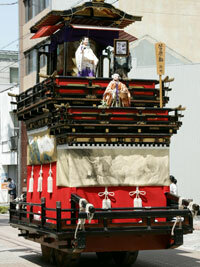 There are three Japanese karakuri on this float, one shio-furi dancer, one calligraphy writer, and one frame holder. The karakuri doll that writes is special in that it is controlled by a combination of strings and indirect methods without using tane-ita. A person (or persons) about two meters below controls the doll, having it write kanji characters with individual strokes, which requires a great deal of intense practice. The famous artist Suiseki Ohashi painted a tiger on the miokuri (rear banner) of the yama, and painted an ink-wash dragon on the maemizuhiki (front banner), which was very uncommon. Since being named Namazu in 1658, this yama has gone through a long history constantly trying to catch a catfish. 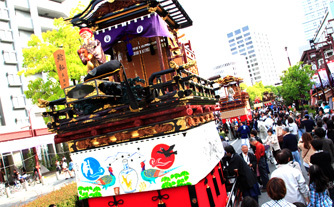 The truly captivating karakuri on this float depict an old man with a red hood and yellow gourd trying to catch a catfish wildly dancing on the water, accompanied by Noh musicians enthusiastically playing bells and Japanese drums. A high priest during the Muromachi Period once famously asked "How can one catch a slippery, scale-less catfish living in muddy water with a round, shallow gourd?" The famous ink-wash painter Josetsu created his most famous painting Hyonenzu (Catching a Catfish with a Gourd), a national treasure, to illustrate this riddle, and this yama was based on that painting. 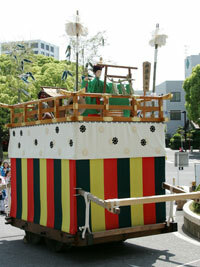 Until the Meiji Era, Takejima's yama was a Korean-style yama, based on an imperial palace car with people around it imitating the costumed procession of Korean diplomats. However, after the Shinbutsu-Bunri-Rei (orders separating Shinto and Buddhism, creating a violent anti-Buddhist movement) of the Meiji Restoration, this style of yama was abolished and it was replaced with Sakaki. 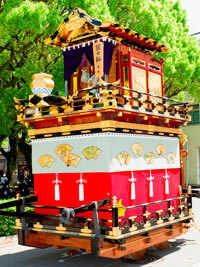 The top of this yama is decorated with sakaki (a type of tree) and sacred mirrors. The goddess Ame-no-Uzume holds a bell and sasaki branch and dances to quiet noh music. 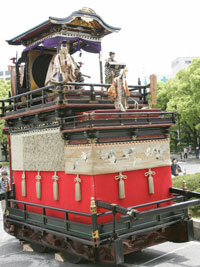 The ability to grasp the bell and wood from atop a plain wood pedestal is this karakuri's special attraction. Taro Urashima stands on top of this yama, with Otohime, Ryujin, and the turtle (all characters from a famous Japanese fairy tale about a young fisherman) behind him, all of them karako dolls. A noh song about Ryujin is used while Ryujin dances, the turtle swims, and the tamatebako (the mysterious box from the story) opens, revealing Mt. Horai. The decorative columns are square and painted red. On the second day, the front banner depicts high waves, while the lower banners are made of felt and depict rogue waves embroidered with golden thread. On the first day, a white background is used. This yama is known for its differences from the others, including having the yakata shaped in a rounded arc modeled after Ryugu Castle (from the Urashima story), and using a tiger skin instead of a tapestry on the rear of the yama. In addition, on the rear of the yama are fabulous engravings of climbing dragons along with spear lances supporting nobori (Japanese battle banners). This yama disappeared from view in 1942 and was destroyed by fire in 1945, but was rebuilt in 2012. This yama used to be called Ishibiki yama. It began as a cart used to collect stone for the Ogaki Castle wall from Mt. Kinsho in Akasaka (in northern Ogaki) before being remodelled into a yama, and thus given this name. Later, in the middle of the Edo Period, Ishibiki yama was changed by adding a doll representing a tenyo (female Japanese Buddhist angel) to the center pedestal on the first level, another one representing the god Hikohohodemi-no-mikoto under the yakata on the second level with a third representing Akamenryujin dancing in front of the god. However, in 1815, this yama was severely damaged in a great flood. It was later restored and has been changed with a great deal of effort into a performance style yama, on which girls perform traditional Japanese dances on the stage for the delighted eyes of the audience. This yama is also known as Benten after the goddess Benzaiten whose headquarters is on scenic Chikubu Island in Lake Biwa. A karakuri doll dances in front of another female doll, but in the middle of its dance, the torso of the doll breaks and folds over, revealing a white rabbit. It then begins moving as if making mochi while mochi cakes are thrown out to the festival audience. 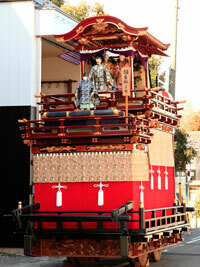 In the front part of Shōchiku is a stage for dancing, making this the only yama where there are both dancing children and performing karakuri dolls. Atago is also known by the name Hachiman. The doll at the top is the worshipped goddess Jingū-kōgō holding a war fan and sword and wearing men's clothing. In the Kojiki (a collection of myths about the origin of Japan), she is said to have left while pregnant for the Korean kingdom of Silla and returned triumphantly, having safely given birth to Emperor Ojin. She is held as the goddess of safe birth. On the left of the mid-level platform stands Takenouchi-no-Sukune, to the right stands a kyogen master, led on the lower platform by a third karakuri swinging branches. 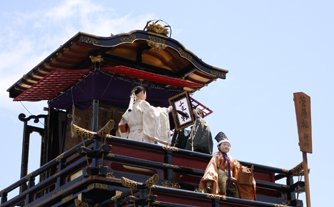 In this karakuri performance based on the noh play Yumihachiman, the old master becomes the god Kora (the embodiment of Takenouchi) and dances a sacred dance. A shinto priest then opens a box in which two doves appear, pecking at beans. This yama gets its name from the noh song with the same title. On the front and sides of this yama are 1000 monkey carvings. It is said that no two look the same. 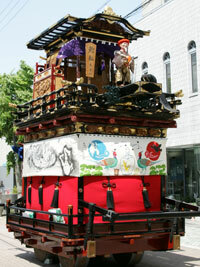 For this karakuri performance, there is a large floor (called a toi) sticking out from this two tiered yama on which a large vase for alcohol rests. The Shōjō doll sticks its face into this vase and gets very drunk. Its face then turns beet red, and the doll suddenly turns into a shishi, or lion. Then the vase splits open and many peony flowers bloom forth from it while the lion tumbles and dances about crazily. While its predecessor was regrettably destroyed in the fires of war in 1945, a new Shōjō was built from scratch 56 years later in March 2001. It has since been painted with Japanese lacquer, provided with metal fittings, and engraved. 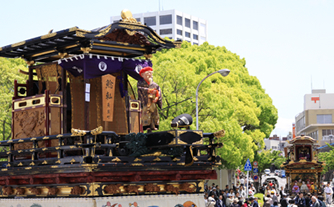 On the first day, each yama is presented at Hachiman Shrine, performs in front of Ogaki City Hall, and then parades independently around the city in the afternoon. 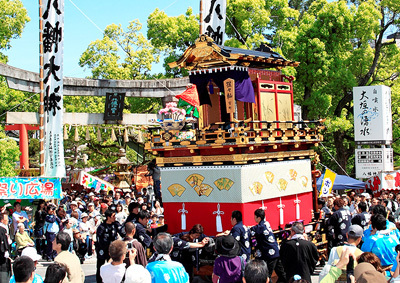 On the second day, after each yama is again presented at Hachiman Shrine, they all parade together around the verdant castle district with Kagura at the forefront. The route is about 8.8 kilometers. 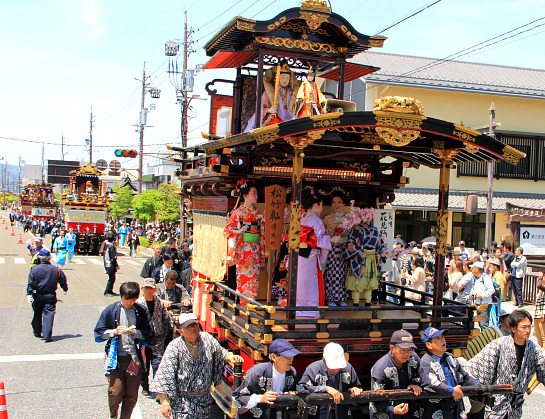 As would be expected for the largest festival in the region, large crowds line the roads, and the castle district is caught up in the beauty of the yama and the excitement on the streets. ※For the latest updates about rain cancellations, etc., please check Facebook (Ogaki Tourist Portal) or Instagram (ogaki_mikke). 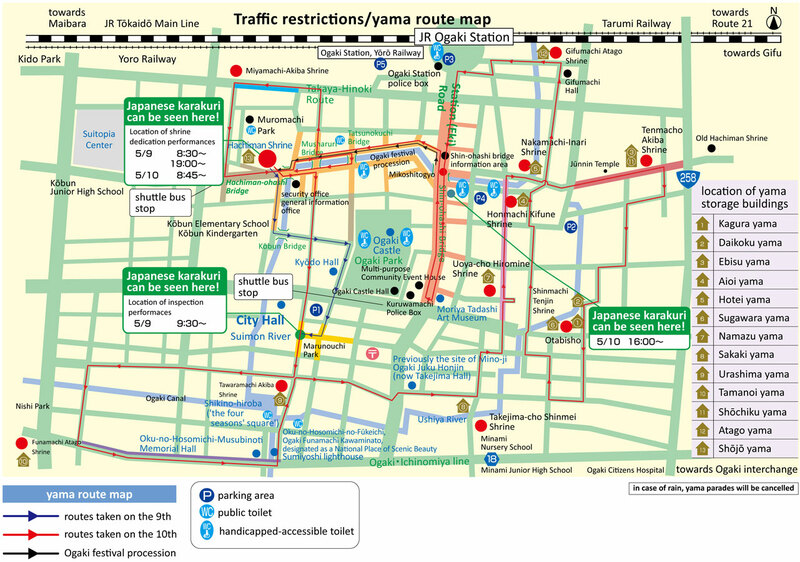 The real-time location of the yama on parade will be displayed here.